Vinings is a census-designated place and an unincorporated town in Cobb County, Georgia, United States, just across the Chattahoochee River from Atlanta. As of the 2010 census, the CDP had a total population of 9,734. 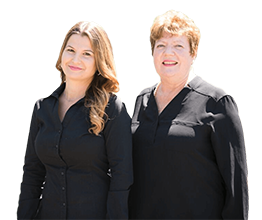 A part of the Vinings, Smyrna, Cumberland (VSC) area, it is located between the affluent West Paces Ferry section of Buckhead in northwest Atlanta, and suburban Smyrna in Cobb County, adjacent to the Cumberland edge city. The U.S. 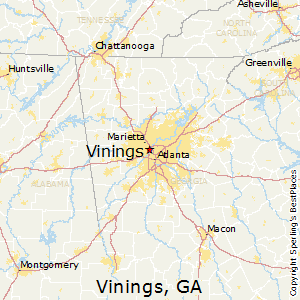 Postal Service assigns both “Atlanta” and “Vinings” to the ZIP code (30339) that includes Vinings. Early on, Vinings was known as Crossroads, and then Paces, after Hardy Pace, circa 1830. He operated Pace’s Ferry across the Chattahoochee River, in this area between Atlanta, Buckhead, and Smyrna. Paces Ferry Road is still the main east/west road through Vinings. The Western and Atlantic Railroad laid rail tracks from Chattanooga, Tennessee to Atlanta in the 1840s. Vinings became a construction station for the railroad, and was inadvertently named for William H. Vining, as he worked on the railroad construction of “Vining’s Bridge” laying tracks in the area. The railroad is still state-owned as it was from the beginning, and is now leased to CSX. 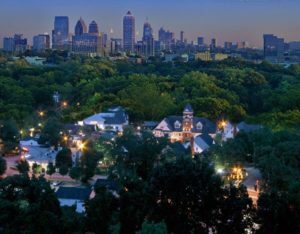 The Union Army occupied the Vinings area during Sherman’s Atlanta Campaign of the American Civil War in 1864 and the subsequent March to the Sea. Pace’s home, which had been used as a hospital for Union troops, was destroyed in the process. Vinings recovered after the war, as Governor Brown leased the railroad to Vinings to bring passengers to the springs and pavilions built to encourage a respite from the reconstruction of Atlanta. Vinings was officially recognized as a community in 1904, the same year the one-lane bridge was constructed across the Chattahoochee River. The town was never incorporated, though it had been discussed whether it should become a “township”. The Vinings Historic Preservation Society seeks to keep the town’s history alive. Vinings is located at 33°51′58.9″N 84°27′57.85″W. According to the United States Census Bureau, the CDP has a total area of 3.3 square miles (8.5 km2), of which 3.2 square miles (8.3 km2) is land and 0.1 square miles (0.26 km2), or 3.34%, is water. As of the census of 2000, there were 9,677 people, 5,227 households, and 1,740 families residing in the CDP. The population density was 3,039.2 people per square mile (1,174.9/km²). There were 5,670 housing units at an average density of 1,780.8/sq mi (688.4/km²). The racial makeup of the CDP was 81.97% White, 12.09% African American, 0.19% Native American, 3.69% Asian, 0.03% Pacific Islander, 0.83% from other races, and 1.21% from two or more races. Hispanic or Latino of any race were 2.26% of the population. There were 5,227 households out of which 11.5% had children under the age of 18 living with them, 26.3% were married couples living together, 5.2% had a female householder with no husband present, and 66.7% were non-families. 43.3% of all households were made up of individuals and 2.4% had someone living alone who was 65 years of age or older. The average household size was 1.84 and the average family size was 2.61. In the CDP, the population was spread out with 10.8% under the age of 18, 15.5% from 18 to 24, 50.9% from 25 to 44, 16.6% from 45 to 64, and 6.1% who were 65 years of age or older. The median age was 30 years. For every 100 females there were 92.5 males. For every 100 females age 18 and over, there were 91.8 males. The median income for a household in the CDP was $88,876, and the median income for a family was $105,121. Males had a median income of $78,685 versus $46,315 for females. The per capita income for the CDP was $61,068. About 3.3% of families and 5.2% of the population were below the poverty line, including 4.1% of those under age 18 and 3.9% of those age 65 or over. Vinings residents attend schools in the Cobb County School District. Residents are zoned to Teasley Elementary School, Campbell Middle School, and Campbell High School. Vinings is unincorporated, and is therefore under the jurisdiction of Cobb’s county commission and other public services. After the success of Sandy Springs, there was discussion and at least one public meeting on whether the town should also incorporate as a “city” (the only type of municipality in Georgia). With residents evenly split, there was no consensus, and the idea was shelved mainly due to concerns about potential property tax increases. However, some expressed optimism that the Georgia Township Act might allow it to become a “township”, equivalent in function to a village in many other U.S. states. This would allow it control of zoning and other land uses (the major dispute with the county), and as written would cap additional property taxes at a half mill (0.5 per mille, or 50¢ per $1000 annually). As of 2013, the bill has not been reintroduced in the Georgia General Assembly. The proposed boundaries were Interstate 285 along the northwest side, Interstate 75 at the northeast end, the Chattahoochee River on the southeast side, and Atlanta Road (old U.S. 41 until Cobb Parkway was built in the 1950s) at the southwest end.